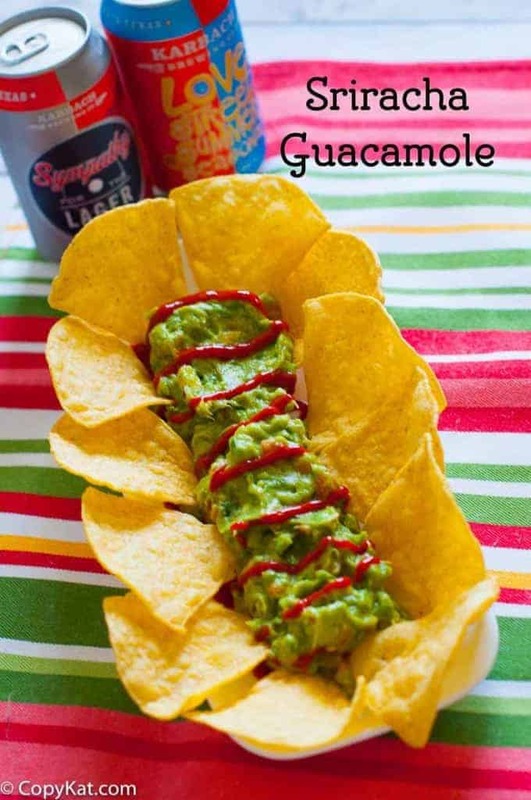 Home » CopyKat Recipes » When Did Sriracha Guacamole Become the Best? Find Out. When Did Sriracha Guacamole Become the Best? Find Out. Are your looking for how to make guacamole? Guacamole typically has avocados, red onions, tomatoes, peppers, and sometimes they put in a squeeze of lime juice. This guacamole has another ingredient that you will love. Who doesn’t love Guacamole? Did you know in some South American countries the word for Guacamole and avocado use the same word? It is believed that guacamole has been around for as long as 500 years. Many Mexican restaurants make this famous avocado dip fresh at your tableside, of course, it costs a lot more when they prepare this dip right in front of you. You may wonder how you can make the best avocado guacamole yourself. The real key is picking fresh ingredients. You will want to select the freshest ripe tomatoes you can find. You will also want to use red onions, fresh cilantro, salt, lime juice, and fresh chillies. For this guacamole recipe, I like to use serrano peppers, but jalapeno peppers work well too. If you don’t like your guacamole too spicy you will want to deseed the peppers when you chop them up. Of course one of the star ingredients in this recipe is the avocado. You will want to pick the a ripe avocado. Finding a ripe avocado isn’t difficult, but you want to make sure it is ripe, but not overly ripe, as either way, the flavor isn’t at its best. You can find perfectly ripe avocados by giving them a gentle squeeze, they should give a little, but not too much. If they give too much, they are over ripe. You can always taste them before using them. If they taste good, they should be good to use. What makes this guacamole recipe special is the addition of sriracha. You may wonder what sriracha sauce is made out of, it is made from a paste of chili peppers, distilled vinegar, garlic, sugar, and salt. The kick of the peppers combined with garlic and more make a hot sauce that is irresistible. This sauce tastes wonderful on eggs, in pho, and just about anything imaginable. So if you are wondering, is this the perfect add-in for guacamole, Sriracha is the perfect addition for your homemade avocado dip. I know that soon your will think that Sriracha guacamole is the best type of guacamole of them all. When Did Sriracha Guacamole Become Unconditional Best? Find Out. In a medium sized bowl add the meat of three avocados, lime juice, salt, onion, chopped cilantro, chopped serrano pepper, and Sriracha. Stir the ingredients are just blended. Add the tomatoes and stir in the tomatoes. Place guacamole on a plate for serving, and drizzle additional Sriracha if desired. This was great, I never thought about using Sriracha.